Do you know of the white-lipped peccary? The white-lipped peccary is a species that represents the tropical forests of Latin America just as much as the jaguar or tapir; however, they are often not nearly as well known. The white-lipped peccary (Tayassu pecari), or “chancho de monte,” has a range from Southern Mexico to Northern Argentina. They are a very important species for tropical forests because they directly benefit the regional biodiversity. When they search for worms and seeds on the ground, they move around the soil making it possible for certain plant species to flourish. 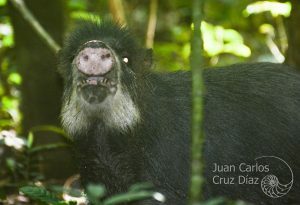 In addition, peccaries are the main prey of the jaguar, the top predator of the continent. For this reason, white-lipped peccaries are often considered one of the best indicators of ecosystem health. Unfortunately, peccaries are threatened due to excessive hunting and loss of habitat from deforestation. They are protected by law in every country where they are found and are included in the Apendix II of CITES (the Convention on International Trade in Endangered Species of Wild Fauna and Flora) and considered ‘Vulnerable’ in the Red List of Species from the IUCN (International Union for Conservation of Nature). In the Osa Peninsula, this species faces great hunting pressure, which has diminished their numbers so greatly in the past few years that they are currently at their lowest abundance in the last 25 years. 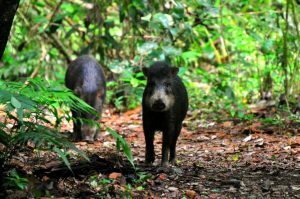 To combat this, Osa Conservation, in conjunction with the Costa Rican government (SINAC-ACOSA), is starting a project to learn more about the ecology of the white-lipped peccary in order to inform and improve a conservation monitoring plan for them. This project will “tag” individuals from different groups with GPS collars which will be monitored and used to generate a distribution map of the species to better understand their habitat-use and to know their real-time location. 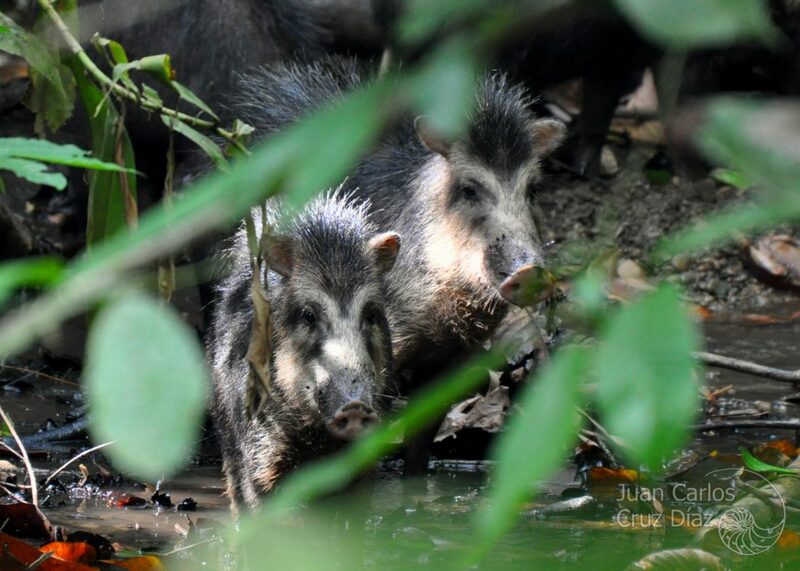 With this information, we will work with our partners to not only improve the conservation efforts of the peccaries, but also strengthen the conservation efforts for the wildcat predators that rely on them for survival. Wildcats, like this jaguar, rely on peccaries as their main prey. In addition, the communities located in the areas next to Corcovado National Park, where the peccaries and many other species live, will be our allies for the biological monitoring of populations of the white-lipped peccary, as well as 19 other species of terrestrial mammals, including the 5 species of wildcats found in the Osa. 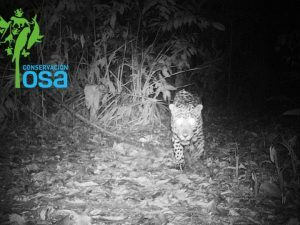 Four local communities (Alto Laguna, Los Planes, Rancho Quemado and Rio Tigre) will perform biological monitoring using camera traps and tracks. Osa Conservation is excited to provide the logistic and technological support and start an environmental education project with local schools and communities. Visitors to Osa Conservation’s biological station will also have an opportunity to more more about this project during their stay. We are excited to be a part of this initiative that brings conservationists, communities, scientists and governments together for a united goal to help protect the health of Osa’s ecosystems!